Triathlons used to be the domain of elite athletes. Not anymore. More than 1 million people stepped up to a triathlon starting line last year--37 percent of them women, according to USA Triathlon. "Triathlons have taken over the reins from marathons as the new personal challenge," says Barrie Shepley, Canada's former Olympic and National Triathlon Team coach. It's no mystery why: The swim-bike-run combo combats workout boredom and practically guarantees weight loss. 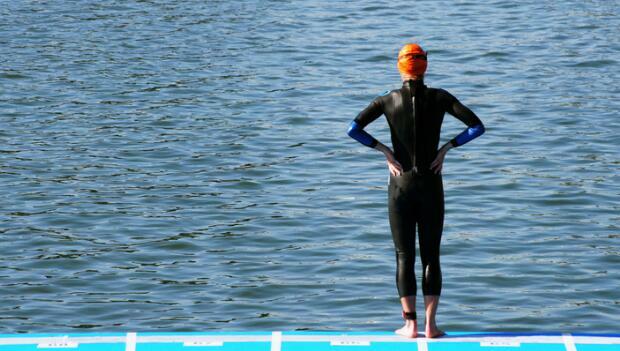 Plus, the popular sprint distance (half-mile swim, 12-mile bike, and 3.1-mile run) eliminates intimidation. Just be forewarned: The feeling of accomplishment coupled with body-sculpting effects can be addictive! Watch any triathlon and you'll see lean legs, flat abs, and sculpted arms whizzing by--all thanks to the one-two punch of endurance and resistance exercise. "Conditioning your body to plug away at three back-to-back disciplines builds muscle endurance," says Lesley Mettler, a triathlon coach in Seattle. "The resistance comes from pushing yourself through water, which is thicker than air, and cycling up hills or into wind. Triathlon training is very balanced--it's whole-body training." And it shows. When you focus exclusively on one sport, you often end up strong in some areas and soft in others. Triathletes get body benefits from all three sports and are lean and fit from head to toe, says exercise physiologist Shannon Grady, owner of Go! Athletics. Plus, the constant cardio can result in serious weight loss. But all that cardiovascular action is good for more than just dropping a few pounds: A recent study in Radiology found that triathletes have larger, healthier hearts and a 17 percent lower heart rate (fewer beats means your ticker is so strong it doesn't have to work as hard) than other athletes. Your joints, tendons, and muscles will thank you too. "Overuse injuries like tendinitis and stress fractures often result from weakness elsewhere in the body," explains Jordan Metzl, M.D., a sports medicine specialist at the Hospital for Special Surgery in New York City and an eight-time IRONMAN finisher. "Because of the amount of cross-training, triathletes build stronger muscles around all of their joints, which reduces their injury risk," he says. "Think of it as building scaffolding around a building." A stronger body and better health starts with this step-by-stroke-by-pedal plan.